Invisalign braces and a wonderful alternative to traditional braces. However, because they are removable, it requires you to be even more responsible when it comes to wearing them according to your dentist’s instructions. Apart from making sure you wear them for the appropriate amount each day, you must be able to take care of them to ensure a successful treatment. If you’re unsure of what to do, maybe it’s time to learn the do’s and don’ts of cleaning and caring for your Invisalign in San Antonio. When you decided it was time to have your teeth straightened, you had two options: Invisalign or traditional braces. 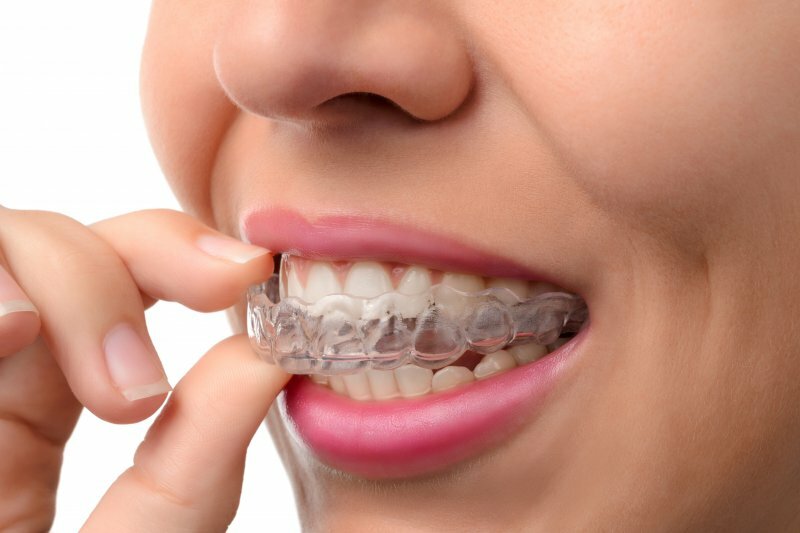 While metal mouth doesn’t sound like a nickname you want to take on at this point in your life, you opt for Invisalign. These clear, plastic aligners go virtually unseen by others, making it a great alternative for adults. Invisalign typically takes a shorter amount of time to achieve results than traditional braces, and they’re extremely low maintenance. Yet, low maintenance doesn’t mean there aren’t steps you should take to keep them clean and healthy. You’ve accepted the responsibility of wearing your aligners and are committed to achieving that straighter smile you’ve always wanted, but now you must commit to taking care of them as well. If bacteria is allowed to build in your aligners, it can transfer to your teeth and cause problems such as gingivitis or worse, periodontitis, which can result in tooth loss. You want to make sure your teeth stay healthy throughout treatment, so here are a few do’s and don’ts to remember along the way. Soak your aligners. Each time you remove your aligners, you’ll need to rinse them to remove any dry saliva or plaque that has built up. When soaking them for a while, use a denture cleaner or Invisalign cleaning crystals. A soft-bristled toothbrush can be used to gently remove plaque or food debris, but be careful not to brush too hard, as it can damage your trays. Clean them thoroughly. Before beginning your morning oral hygiene ritual of brushing for two minutes and flossing, make sure to clean your trays to remove any bacteria that gathered while sleeping. Pack an extra set when traveling. If you plan to be out of town for a few weeks, make sure you pack your next set of aligners, so you don’t delay your treatment. You don’t want to put off that straighter smile, do you? Eat or drink with them. Always remember to remove your aligners before eating. They’re not designed to withstand the pressure you put on your teeth while eating and can become damaged easily. Use scented or colored soap. These may be pleasing to the eyes and nose but expect to cringe the moment you put your aligners in if you’ve cleaned them with a scented or colored soap. Not only will the color stain your trays, but the scented soap can create a bad taste in your mouth, literally! Use toothpaste. While it may seem normal to use toothpaste to clean your trays, it can damage and dull them. One of the main reasons people choose Invisalign is because you can’t notice them; however, if they lose their sheen, you can bet others will notice something different about your teeth. If you want a successful treatment, stick to the above-mentioned do’s and don’ts. You can rest assured you’ll not only be taking proper care of your aligners, but you’ll have a straighter, more beautiful smile in no time. If you’re looking for a trusted dental team who offers a wide variety of dentistry services, Jones & Knight, DDS is for you. Caring for patients of all ages, we can give you the smile you’ve always dreamed of in both of our state-of-the-art dental practices. Need your teeth straightened? Let us help with Invisalign! To learn more, contact us via our website or by calling (210) 494-4407.